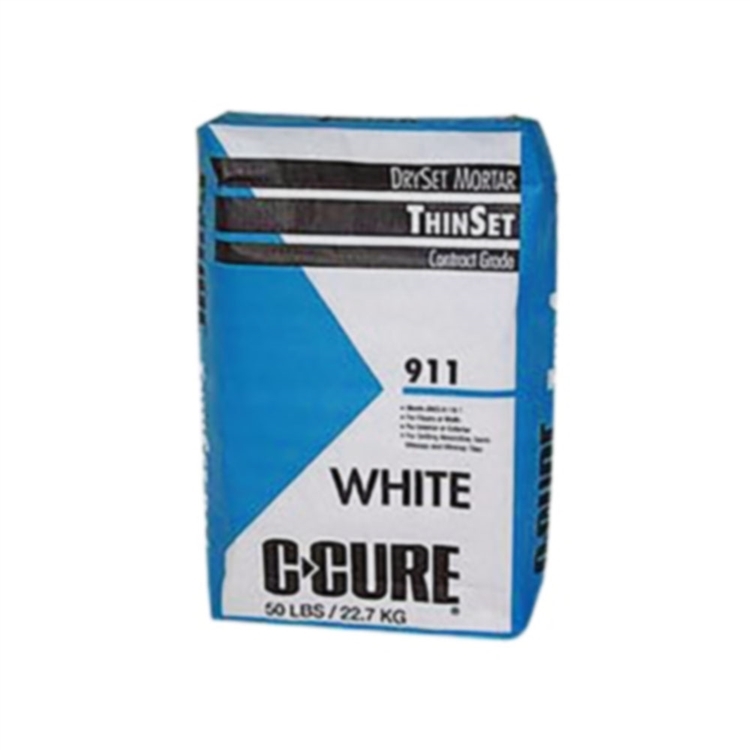 C-Cure Thinset 911 is a factory blend of Portland cement sand and a unique blend of special additives. C-Cure Thinset 911 produces an excellent bond with greater coverage than conventional dry-set mortars for the installation of ceramic tile. It's to be used as a bond coat for setting absorptive, semi-vitreous and vitreous ceramic tile for service in residential and commercial use for both floor and wall installations. Spread mortar with flat si de of trowel to key into substrate. Then, apply additional mortar to a depth sufficient to be notch with a suitable trowel that will leave only enough mortar to give 100% contact with back of tile and a subsequent mortar bed of 3/32" to 3/16" (2.4 to 5 mm). With high lug tiles, “back buttering” may be required to ensure 100% coverage to back of tiles. During the setting of tile it is advisable to occasionally remove a tile to be sure mortar has not skinned over and sufficient transfer is being made. It is also required that tiles be embedded to obtain good transfer of mortar to tile and for proper alignment. Do not adjust tiles in mortar after they have been set past 10 - 15 minutes. NOTE: As a practical test it is recommended that 3 or more separate 12" square (.3 m2) areas of tile be bonded to the properly prepared surface with the actual tile and bonding material that will be used on the finished installation. These should be allowed to cure for 3 to 7 days and then removed with a hammer and chisel. At this point, one can determine if adequate bond has been obtained or if a problem exists.